We at Knox Clinic Pediatrics are your source for experienced health care for your child, from the moment of birth to well into the teen years. We are your partners to ensure that your “baby” has every opportunity to grow and thrive into healthy adulthood. Our relationship with your family begins with care for your newborn – including circumcision, if desired – and continues with well baby and well child checkups, inoculations and treatments when your child is ill. We also perform school and sports physicals. At Knox Clinic Pediatrics, we can provide specialized services as well, including asthma management and management of behavioral problems, such as those associated with ADHD and autism. Our physicians also perform allergy testing. 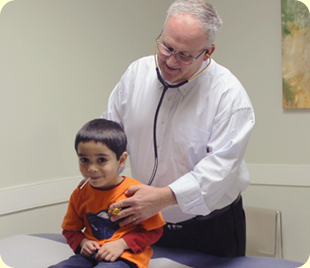 We’re your partners in helping our young patients avoid illness. Through nutritional counseling, we support families in making wise food choices that keep children active and at a healthy weight. ©2012 Knox Clinic Pediatrics, PLLC. All rights reserved. Web design & hosting by WordwrightWeb, Wilmington NC.